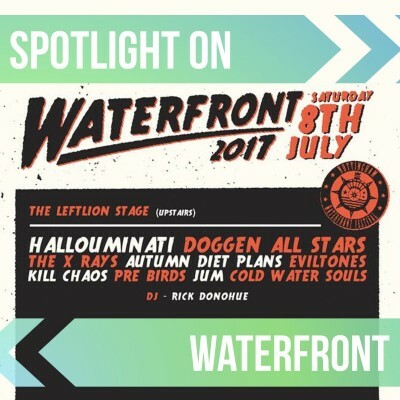 This weekend sees revellers make the most of the fantastic weather by heading to the Canal House in Nottingham to enjoy Waterfront Festival 2017 on Saturday 8th of July. The annual celebration is brought to you by I'M NOT FROM LONDON PROMOTIONS and Audacious Face and features 13 hours of sheer delight featuring 35 bands and artists held across 3 stages including our very own Gigantic Stage. Look forward to performances from Hallouminati, Unknown Era, Doggen All Stars, The Most Ugly Child, Just James, Bud plus many more. Waterfront Festival is one of the best loved events central to a city famed for its rich music scene. Raising funds and awareness, the day festival is held in aid of Wolfson Cystic Fibrosis Centre and Roy Stone Foundation. Each year attendees are encouraged to arrive in fancy dress and the theme for this weekend is B Movie Monsters & Mythical Creatures of the Watery Depths so let your imaginations run wild and come decked out in your finest aquatic attire. We take a look at some of the stunning acts that you can see this Saturday! Waterfront tickets are currently available. Whether it is their visceral and brutish post punk tracks like ‘Solid Gold’ and ‘Revolution’ or their anthemic belters ‘Money’ and ‘I’m So Wet’, there is always a feral undercurrent to Avalanche Party which gives the allure of danger. Pinned by many as the band to explode this year, do not miss you chance to see them at Waterfront 2017. Hull’s finest speed garage punks No Nothings are certainly the ones to watch. Every performance is blisteringly fast and devastatingly loud making for one hell of a ride! Just don’t say we didn’t warn you when your ears are still ringing the next week. Two-piece hard rock outfit Chambers are pioneers of ‘Sister Doom’, their very own sound packing a hard-pneumatic punch accompanied by cold and removed vocals that draws influence from horror films. Autumn Diet Plans are one of the most exciting bands to recently emerge from Nottingham’s fertile musical breeding grounds. The slacker troupe tap into grunge and psyche and have a real knack for writing truly catchy tunes. Garage band heroes Thee Eviltones with their dark surf sound are perfectly suited for the festivals B-movie sea monsters theme. Rock and roll action at its absolute finest.